Week three saw the Giants lose 29-27 to their division rival Washington Redskins due to turnovers and a multitude of penalties. Though the Giants running game rebounded from week two to three ( 64 to 120 yards ), the Giants abandoned the run in the second half against the Redskins, rushing for only 25 yards in favor of focusing primarily on the passing game. The opportunity to go 3-0 while greatly diminishing the Redskins’ chances of making the playoffs slipped through the Giants’ hands. Since 1980, 164 teams have started 0-3 with only five of them making it to the playoffs, just 3 percent. The Giants will have to hope that this loss doesn’t come back to haunt them later in the season. In the Vikings 22-10 win over the Carolina Panthers in week three they managed to sack Cam Newton 8 times, bringing their total sacks to a league leading 15 through three games. Their defensive line is led by Everson Griffen, Danielle Hunter, and Linval Joseph (4, 3, and 3 sacks respectively). 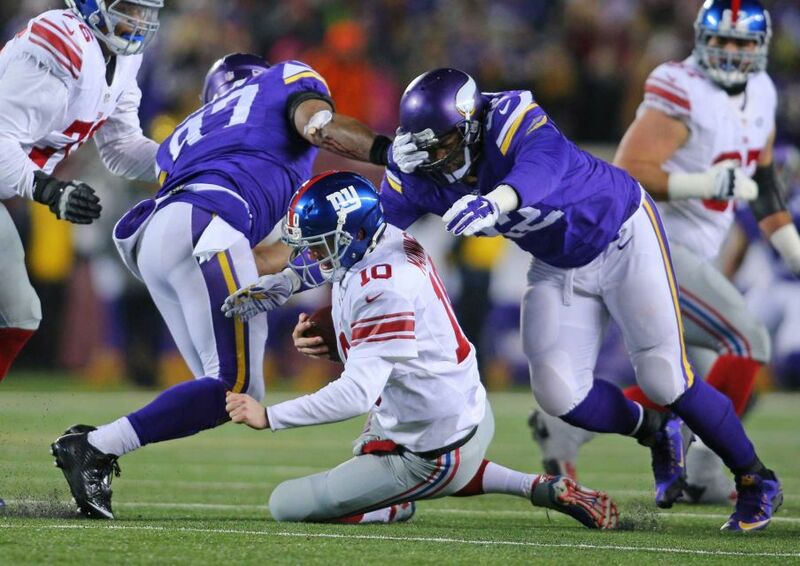 The Vikings defense is holding opponents thus far to only 13.3 points per game and 4.4 yards per play surrendered. The Giants offense will be fighting an uphill battle as they will be playing without Shane Vereen who sustained a tricep injury in the Redskins contest which has put him on injured reserve along with Rashad Jennings who is questionable with a thumb injury. The Giants offensive line will need to give Eli Manning time to find his receivers and allow the running game to get going or the dominant Vikings defense will control the line of scrimmage from the outset of the game and continue their trend of holding teams to just under two touchdowns per game. Marshall Newhouse will also be missing his second consecutive game with a calf injury so Bobby Hart will start again in his place. Through the first three games of the season Eli Manning has thrown 3 picks and team has lost 4 fumbles. Their sloppy play finally caught up to them against the Redskins when 3 turnovers ( 2 INT’s and 1 fumble ), and 11 penalties for 128 yards helped the Redskins secure the win. The Giants need to minimize their mistakes on the penalty front and end the negative trend of turning the ball over if they expect to have a fighting chance against the Vikings. If the Vikings are able to force turnovers and prevent the Giants offense from getting into a rhythm then the game may become a one sided contest. A potent Giants running game should feed into their passing game succeeding against the Vikings secondary. The issue is that due to injuries to Vereen and Jennings the Giants will probably be relying primarily on Orleans Darkwa and Bobby Rainey. Darkwa did very well with the touches that he was given against the Redskins ( 10 carries for 53 yards, 5.3 yards/carry ) and Rainey caught a single pass for a 24 yard gain in the same game. Both players roles will clearly be expanded with Rainey filling into the Vereen role as the running back who’s also a capable receiver. The Giants have rushed the ball 24, 28 and 21 times from week 1 through week 3. The number of times they rush the ball and how they divide them between the two will be something to keep track of along with their ability to help protect Eli in blitzing situations. It’s a big moment for both players to come in and make a necessary positive impact on the game. Going into this contest the Giants are without safety Nat Berhe (suffered a concussion in week 3), safety Darian Thompson (Foot injury, will miss second straight game), cornerback Eli Apple (Hamstring injury, is doubtful ), and Dominique Rodgers-Cromartie (groin injury, is questionable). Undrafted rookie safety Andrew Adams who’s never taken an NFL snap is likely to start alongside safety Landon Collins, with Trevin Wade and Leon Hall probable starters at cornerback. Rookie cornerback Michael Hunter is back on the roster and will also see playing time. The depth that they once had in the secondary is no longer there due to the recent onslaught of injuries so it will be up to this small unit to contain Minnesota’s top two receiving weapons, wide receiver Stefon Diggs (20 receptions for 325 yards and 1 TD), and tight end Kyle Rudolph (14 receptions for 166 yards and 2 TD’s). The Minnesota running game should be a non-factor in the game. The Vikings lost Adrian Peterson to a knee injury suffered in the second game against the Green Bay Packers. Even with Peterson in the first two games the Vikings running game struggled mightily. If the Giants can limit the production of Diggs and Rudolph that will go along way to forcing the Vikings offense to try and run the ball effectively, something they’ve been unable to do thus far. The Vikings have a total of 153 yards rushing in the first three games at 2.1 yards per carry. The Giants defensive line needs to get pressure on Sam Bradford early and take him out of his rhythm. If they can do that it may force Bradford to rush through his progressions and make things a bit easier for the secondary throughout the game. ← Previous Story Can Jets’ Fitzpatrick Rebound In Week 4?